Publication History: This article is based on Chapter 6 of "The Log Analysis Handbook" by E. R. Crain, P.Eng., published by Pennwell Books 1986 Updated 2004. This webpage version is the copyrighted intellectual property of the author. All of these alternate shale volume methods are more than adequate, but suffer from strict limitations on their use. EPT and capture cross section are rare log curves. 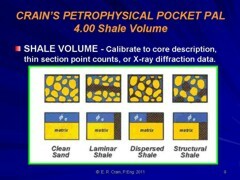 A number of useful shale volume methods have more restricted application than the more common methods described earlier. The four listed below have proved useful on particular projects that needed help. The reader should take a moment to define the parameters and work a hypothetical numerical example. The electromagnetic propagation attenuation curve works well, especially in thinly bedded sand-shale sequences because the tool has a bed resolution of 4 to 6 inches. Attenuation increases with shale volume. The deep resistivity sometimes can be used in hydrocarbon bearing zones, especially tar sands. Calculated shale volume will be too high in water zones or swept zones when the water is fairly salty (WS > 10000 ppm NaCl), so another method, such as the SP or GR, should be used as well. Resistivity decreases with higher shale volume. The method is very useful in shallow shaly sands where kaolinite or feldspar makes the gamma ray read high. The clean and shale resistivity values can be picked from suitable cross plots or from depth plots. In many shaly sands that are invaded with normal drilling mud filtrate (Rmf >= 0.50 ohm-m), the shallow resistivity may be a good shale indicator. Again, this is a very useful method in feldspathic sandstones, and there is better bed resolution than the deep resistivity. Do not use microlog or microspherically focused log as RESS. All cased hole thermal decay time logs display a SIGMA curve as one of the primary measurements. Although there are hydrocarbon effects, the curve can sometimes be used to overcome problems with the gamma ray log, such as uranium precipitation on casing or tubing, or missing GR log. This method is not very accurate as the spread between PE of quartz and shale is not large. The equations reproduced in the table below provide most of the known relationships for calculating shale volume. This material is reprinted courtesy of Dresser Atlas.